A straight forward device, the current to pneumatic converter produces a pneumatic output signal that is proportional to an electrical control level input signal of 4 to 20 mA or 10 to 50 mA. This provides a useful interface between electronic controllers and pneumatically operated valves, air cylinders, or other air operated control elements. 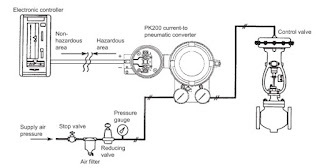 Pneumatic signals are regularly used throughout many installations as matter of safety, legacy, or because a pneumatic signal can provide motive power to an operating device such as a valve positioner. Electrical control signals can be transmitted long distances across wires to deliver control signals to operating elements. The current to pneumatic converter provides a bridge between the two systems and allows the most beneficial aspects of each to be brought to bear on process operation. Converters are available in standard variants that accommodate a number of hazardous location designations, as well as several output pressure ranges and calibrations. Share your process control connectivity challenges with application specialists, combining your own process knowledge and experience with their product application expertise to develop effective solutions. Current to Pneumatic Converter from Miller Energy, Inc.